DR12 is a PERFECT COMBINATION of the best WORKSHOPS counterbalanced by CRAZY BEACH, CATAMARAN AND CITY ANIMATIONS (=Fun Activities) finalized by the most wanted CONCERTS AND NIGHT PARTIES. DR12 will have all dominican dance genres bachata, merengue, tipico, mambo, palo, dembow, bolero and son. The main focus is in authentic bachata. Being focused on authentic bachata does not mean we are narrow minded. We like to dance everything in the fun activities but the parties and concerts in the local clubs follow the Dominicans rules. DR12 Dominican instructors are really famous in salsa also. Here they dance on a rugged stone surface with flip-flops. For sure we will do BeachBachata, PoolBachata, CatamaranBachata, IslandBachara, JungleBachata, RiverBachata and WaterfallBachata. We are crazy enough to do ShoppingBachata, AirportBachata, BusChata, StreetBachata and LiquerStoreBachata. It's so fun to do AguaBachata, OceanBachata and MudBachata. We will have Fun Activities in Catamaran, Saona Island, Zona Colonial and Ruta Bachatera. The animators include the best ever Carlito and Yocasti, Julio, David and Jean. DR12 will the funniest festival in the world. In addition to offer the highest knowledge of authentic bachata you'll get the crazy beach parties and the hyperactive fun masters. 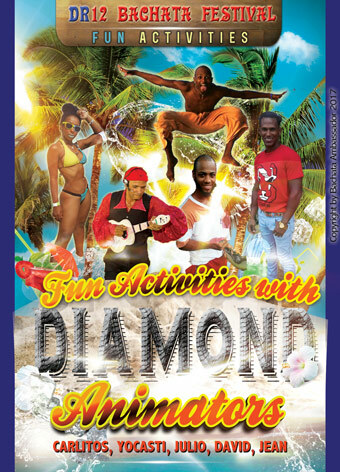 Fun Activies include animations (follow me group dancing), games, shows, acrobatic specialties and social dancing. You can lay down and just admire the facination show or even better to participate, sweat and swim. DR12 parties, concerts and excursions are in a far away places, but the bus rides are always like a crazy circus.